One of the things that our Masonic forefathers were known for was the ability to leave their mark. Whether this was the stonemason in the quarry placing his rudimentary signature on a hewn block, or the philosophical Mason giving his signature to warrant a new Lodge, they all had a desire to do something that would be recognized in the world long after their time on this earth has gone. Operative builders erect monuments; speculative Masons create legacies. We all have this inherent desire to leave a legacy for future generations. For many, it is simply a family legacy of children and grandchildren, to perpetuate the family name. For others, it is a legacy of action and service to others. Sometimes it manifests as wanting to make “your year” as Master one that the Lodge won’t soon forget. It could be shown through a program that your Lodge takes up and continues to support for years to come due to your involvement. Even financial “legacies,” such as gifts to the Masonic charities or endowments to your Lodge can leave their mark on history. 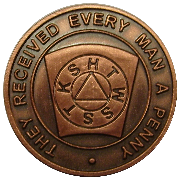 Yet, each of us is overlooking one of the easiest legacies we can leave – that of being there for a member of our Masonic Youth Groups. There isn’t one senior or majority member of a Masonic Youth Group in Pennsylvania who doesn’t have fond memories of the adults who were involved with the organization. From Rainbow Girls who were guided by Mother Advisors, to Jobies who depended on their Bethel Guardians, or DeMolays who learned important life lessons from their Chapter Advisors; the adult volunteers of our Masonic Youth Groups are leaving a legacy bigger than they could ever imagine – that of memories and positive experiences, moral training in Masonic principles, and guidance in the exercise of leadership skills. Make your New Year’s resolution one that counts – assisting a Masonic Youth Group in 2015.